While store-bought ketchup has become a staple in most fridges, it comes a time that we must pull up our bootstraps and make our own. With fairly simple ingredients we can make plain ol’ketchup into a gourmet condiment. You can even add flavorings such as basil, oregano, chili powder or tabasco sauce to add an extra dimension and character. 1. On medium heat, sauté the onions in olive oil until they become transparent. 4. Add the cider vinegar, let come back to simmer and let cook for 10 minutes. 5. Add the garlic powder, onion powder, celery salt, mustard powder, salt and black pepper. Mix well. 6. Lower heat and let simmer, uncovered for 5 minutes, then add the balsamic vinegar. 7. Add some lemon juice while simmering. 8. 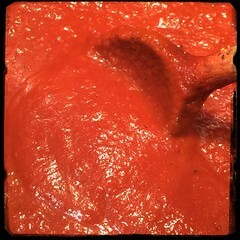 Let simmer, uncovered, until it thickens to the consistency of your liking, it may take 30-45 minutes. 9. use an immersion blender to make smooth.